Before we moved in, we had a whole house (electrical) re-wire followed by various rooms being re-plastered, painted... and finally furnished! Our main bedroom is the first room to be properly finished, which feels oh-so-lovely after months of dust and boxes stacked high. I plan on putting a full post live soon, documenting just how far we've come with this room - including before, mid-way and after pictures. Watch this space! But for now I wanted to jump right in and show you the final product; our beautiful, comfortable and fresh new bedroom. One of the most important things for both Rich and I was getting our bed ~just right~. 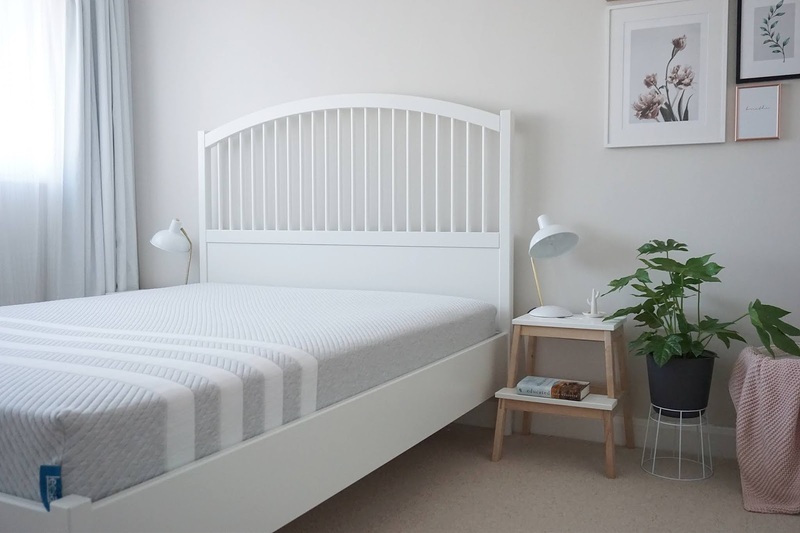 When we moved in together back in 2012 we brought my old double bed from my parents house with us, and bought an old mattress from a family friend - all very budget but fine for the short term. Fast forward six years and four house moves, we were ready to upgrade! 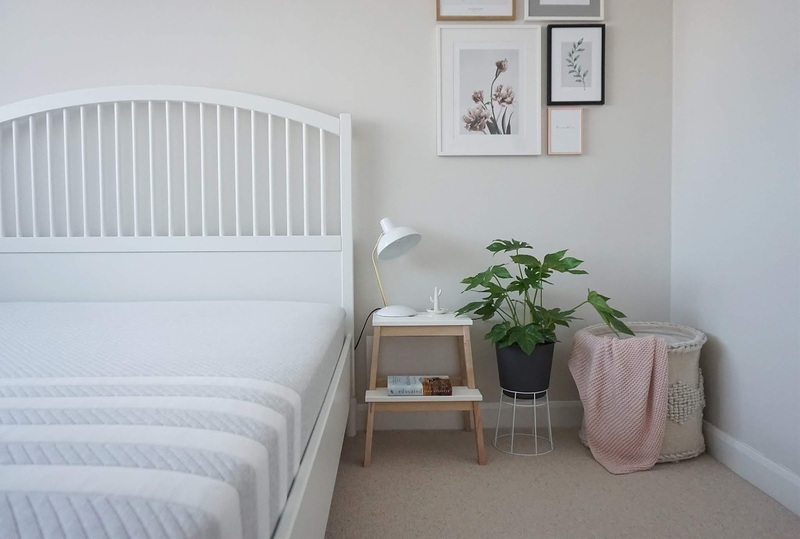 Finding the bed frame was the easy bit, but choosing the perfect mattress? That was the real challenge! Turns out trying to find the perfectly firm-yet-soft mattress ain't that easy! Yes, Goldilocks, I know. We went to a few furniture shops and left feeling totally overwhelmed. So many different brands with different features and such a wide variety in price points... we just didn't know where to start! In the interests of complete transparency: this mattress was gifted to me with the view that I would write a review. Of course and as ever, all words, thoughts and views my own. 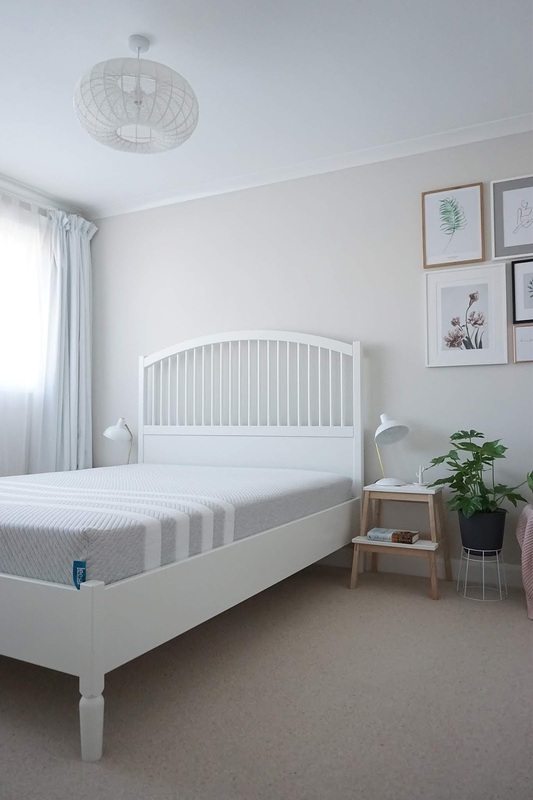 Featuring three foam layers; 5cm of avena foam, 5cm of memory foam and a big 15cm chunk of support foam, this mattress seems to answer all of those sleep woes I had been concerned about. 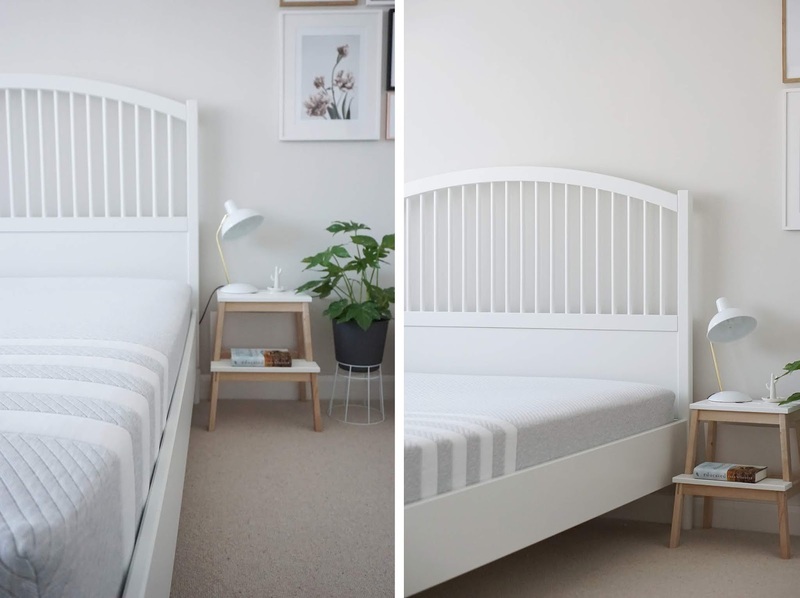 The avena foam allows for a cool night's sleep - something I had worried about, as people often moan about foam mattresses getting really hot and uncomfortable. It is a responsive layer, letting air flow through the mattress. Hurrah! Aside from the heat thing, I suppose my biggest concern was that this would be too soft. It claims to be a medium-firm mattress, but we tried so many mattresses in furniture shops that claimed to be firm but felt.... well, not. I often suffer with lower back pain and know from experience that a soft mattress just exacerbates this. Our old mattress, albeit lumpy and uncomfortable, was super firm and I found myself getting used to this level of firmness. When I would stay at my parents house I would struggle with their medium-firm / softer mattresses, sometimes not even being able to sleep as my back would ache so badly. So the idea of a softer mattress scared me. The verdict? Wow. Yes, wow! I have never slept on such a comfortable mattress! It is firm yet soft, and aside from a couple nights of slight discomfort when I was getting used to our new mattress, I haven't struggled with back ache since. In fact, it has completely transformed my sleep. I find myself waking up feeling physically rested; no back ache, no sore hips from lumpy springs (a real problem with our old bed) and not tired from tossing and turning all night trying to get comfortable. I feel completely supported. Is Rich as convinced? Yup! Like me, he feels like the Leesa mattress has revolutionised his sleep. Coming from such an uncomfortable mattress to this feels like a total turnaround - we're not using the word revolutionised lightly! What about the downsides. I can't really think of any to be totally honest, aside from the fact we've had to buy new bedding now we've upsized from a double to a kingsize! 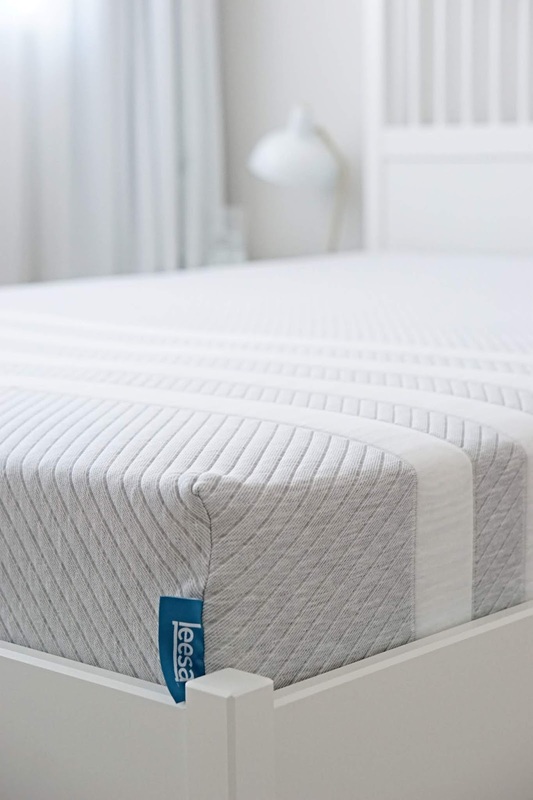 I have found that the Leesa mattress really needs deep fitting sheets, as it doesn't have stiff corners like our old sprung mattress meaning the sheets have less to 'cling' to. Would I recommend the Leesa mattress? Yes, and I have! I would totally pay full price for it. It is worth every penny - I don't think we fully appreciated how terrible our old mattress was until we got this. In hindsight I wish we had upgraded sooner. It comes with a 100-night risk-free trial, meaning you have one hundred days to make up your mind. 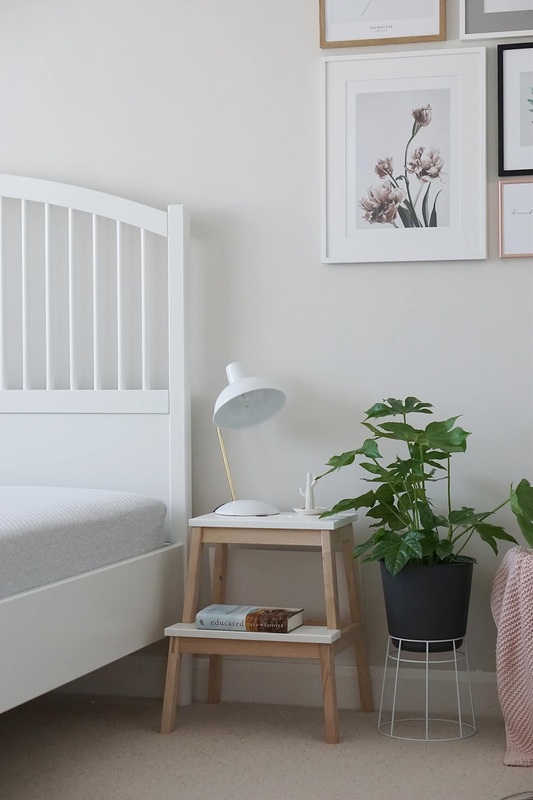 Not only is it perfect for us, but Leesa Sleep clearly take their social impact seriously, too. Any mattress that is returned within that 100 day trial period is donated to a local charity or recycled. Not only this, but their One-Ten programme donates one mattress for every ten sold and the One Earth programme sees Leesa Sleep plant a tree for every mattress sold. Yes, really! Good work, guys. And you lovely lot? Well, I have a treat for you too! Fancy £100 off your own Leesa mattress? Yeh, I thought so. Just use the code LIZZIELATELY at the checkout! Post in collaboration with Leesa Sleep. Links in this post are affiliate links; this means I may receive a small percentage of a sale if you click the links and purchase a product.